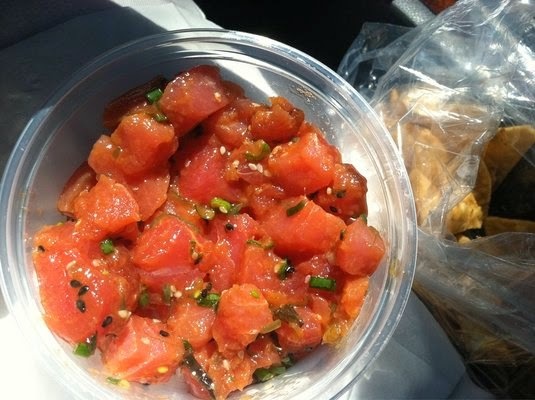 After visiting Hawaii a few years ago, I fell in love with something called poke. It usually is ahi tuna chopped up into cubes with some seaweed salad and different types of sauce - soy sauce, teriyaki, and hot sauce. Everyone has a different way of making it, but it is so good. As the days get warmer, I find myself craving it. 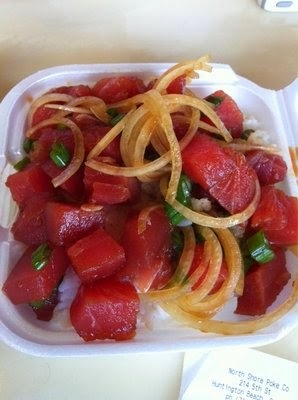 A friend recommended North Shore Poke in Huntington Beach as one of the best they have had on the "mainland." The fish was great, but the service was horrible (didn't help that it was St. Paddy's day). I enjoyed that they made it fresh to your order, but this meant that the fish didn't really soak up the marinade. 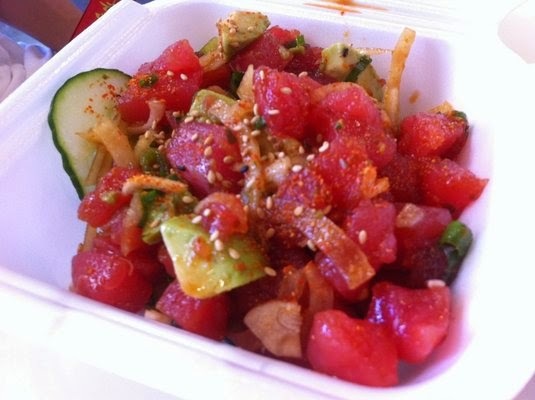 Bear Flag also has ahi poke. It comes with tortilla chips and sits in the marinade for at least a day. North Shore gives you options of your marinade, but Bear Flag just has one type. The fish isn't quite as good a cut as North Shore, but I prefer the fact that it is cold and sits in the marinade. 3.5/5 for North Shore, 4/5 for Bear Flag - but only because its "mainland' poke, and a personal preference of marinade flavor over "have it your way."